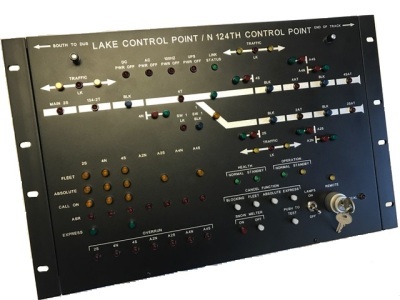 The NAS LCP controller with panel faceplate provides automated control of local control panels utilized for wayside control applications. The module is designed to provide discrete control of panel functions using serial commands provided by solid-state interlocking controllers such as the VHLC unit, the Microlok systems and ElectroLogIXS. The NAS LCP controller with panel faceplate provides automated control of local control panels utilized for wayside control applications. The module is designed to provide discrete control of panel functions using serial commands provided by solid-state interlocking controllers such as the GETS VHLC unit or the USS Microlok systems. Serial protocol communications to other devices can be provided based on customer request. Controllers can be interfaced to custom or generic faceplates designed and manufactured by North American Signal. The controller and faceplates make up a single self-contained aluminum enclosure that can be shelf wall or rack mounted in an instrument house. The LCP controller comes equipped with onboard isolated power supply along with isolated 232E, 422 or 20MA loop for direct isolated interface to a controller's communication port. The unit is expandable to accommodate up to 128 inputs and 128 outputs in a single module. Inputs and outputs are blocked in groups of 16 to easily handle bit mapping of the discrete devices. The on-board processor provides additional features such as self-diagnostic indicators and custom functions allowing the user more flexibility in the design of the local control interface. Serial protocols are easily changed with the selection of onboard rocker switches allowing one device to be used for all of your remote control applications. Faceplates used for discrete control and indications are manufactured per customer specification. Location details can be displayed on photo etched or silk screen panels. Various types of indicators and controls such as LEDs and pushbutton switches are included with a turnkey solution offered by NAS.